Elephants are great travel companions since ancient times. 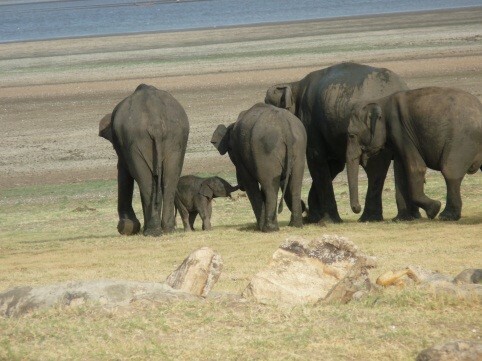 Habarana located 210 km northeast from Colombo is the transit point of the large herds of wild elephants at the National Parks of Minneriya and Kaudulla. An adventurous Sri Lanka safari and a visit to Minneriya National Park to experience the elephant gathering is a memorable experience. It is a truly memorable experience, and unforgettable opportunity to watch the social dynamic of these great creatures at Minneriya National park. During the dry season (August to October) when water supplies start to reduce, more and more animals gather around Minneriya National park due to the reservoir. You can view around 300 to 400 elephants at a time. They are not migrating, they are simply gathering to socialize, bathe, drink, feed and possibly mate. You may choose to take a jeep safari to MInneriya National Park to observe these beautiful creatures. Elephant back safaris in Habarana are one of the most thrilling safari experiences in Sri Lanka. And this is not just a ride on the largest animal, but it’s an unforgettable experience where people get to interact with the elephants as well as enjoy a ride through wilderness areas and beautiful sceneries.